Great links Paul, explains it very well though the Caesar 15th century knights I just ordered might not be entirely correct for my 1361 date but not really a problem in this scale, they have some shining armor that's what counts. Really looking forward to painting medieval figs again. Nice one, and same figures I plan to use for civilian onlookers. Btw were the upper part of the walls like that in 1361? Sometimes the wall is depicted as it is today. Have no idea how the walls looked in 1361. 1986 I know for certain. The wall is from Valdemar's Castle, the back of the stable. All I have and I thought it could be nice to use it like this. I think your best option is to make them like today, just not as much ruined. Think some of Nikolai's civilians could look nice there too. Well I need to research some more it seems. Nikolai figures look great but that worries me, that they are actually much larger than most 1/72 figures. Ah ha!! VIsby! Ok..then you can go a bit wider with your choices for sets. The Gutnish army were mainly yeomen /militia and used older types of armour than plate, in fact, full plate wasn´t so common at all. Yes I've been a bit secretive about my next epic diorama project, anyway what about full shabraques on horses? I ordered the Emhar Crested knight set, seems like one character could be Valdemar himself or some commander and a couple of mounted standard bearers. Reenactments seem to portray horses without them, I could find new horses for the figures though. I saw your work on them Paul btw looks good. For Gutnish army I plan to use the lightly armed figures from the Zvezda English and French 100 years war sets, the crossbowmen for Valdemar's Danes and German mercenaries, archers for the poor Guts. This will be difficult, but not impossible. will have to modify the Miniart castle model.. Those wooden magazines on top might be done in some 3d Printing I hope..Any suggestions for who could make the magazines are very welcome. Traveller1865 wrote: anyway what about full shabraques on horses? . By full shabraques do you mean Caparisons? The Castle. It doesn´t look too complicated and shouldn´t be too much to re-create by scratchbuilding ? Paul wrote: By full shabraques do you mean Caparisons? Yes I meant caparisons, seems google translates it to shabraque, maybe theres no Swedish word for it. Yes scratchbuilding shouldn't be a problem, its just Im very busy most of the time though could be a summer project. Great, I'm obviously no expert, somehow I thought they were rarely used in battle. It's not known if horses were with Valdemar and his troops but surely Valdemar and his closest would have been mounted. Theyéd have definately have nags with but seeing as the majority of battles were fought on foot , nags being either used for a massive Impact Charge or chasing the fleeing enemy (niether case at visby) they would have been Held in the rear. Didn´t they rip down part of the walls to ride into the City? If so then they definately had nags. Nothing is known of the actual battle, if there were any official information it was probably stored in an archive that burnt down in the late 17th century. 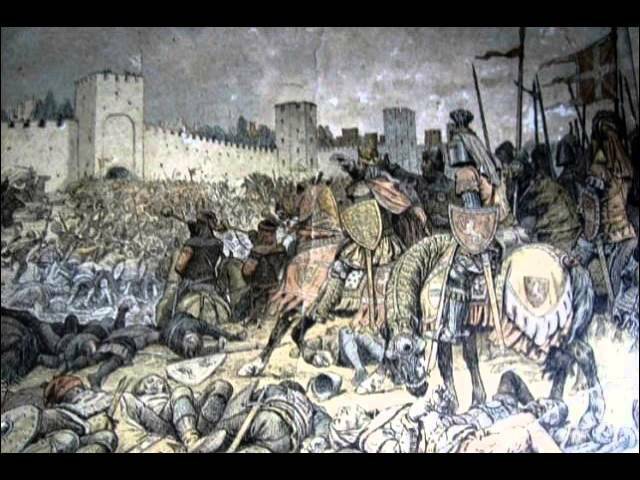 They didn't tear down the wall, the city people who watched the battle managed a deal with Valdemar and paid some taxes while Valdemar's troops plundered the countryside. I plan to have Valdemar and his entourage in the rear, that Emhar set is really impressive. 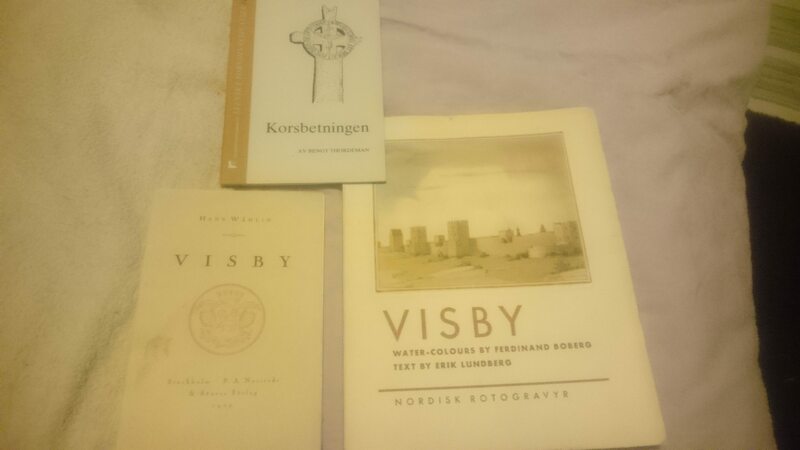 Found three old books in the hobbyroom, one from 1924 with black-and-white photos, one from 1939 with water colour paintings, and one from 1982 with just text. The problem is the walls look just like when I was there 1986. Are there any figures you need I can check the collection. Going to read a book I just received if there's more info on the general appearance. Apparantly there were too deep moats in front of the wall, not waterfilled. The sources I have all suggest the appearance like that of the model. There was a wooden platform that the citizens of Visby would have stood on watching the battle. Difficult stuff here but not impossible. Well some of the Gutnish peasant militia have arrived, courtesy of Tumbling Dice, not the best figures but can be used for other periods where peasants were involved in struggle like the German Peasants War etc. Some assembly with a variety of peasant tools which is interesting, these poor peasants had no chance against the trained mercenary forces of Valdemar. Need help, the wall was/is 11 metres high, how tall is that in 1/72 scale?